Terry Dillman, owner of Don Kauffman's Sewing Machines, came into the home sewing market after years of experience repairing factory machines in the many textile factories in the Reading area. In 1996, with the retirement of Don Kauffman, Terry became the owner of Don Kauffman's Sewing Machines and machine technician for not only the machines we sell, but also any machine you have of most brands. Terry is a certified technician for Husqvarna Viking, Janome and Singer sewing machines. 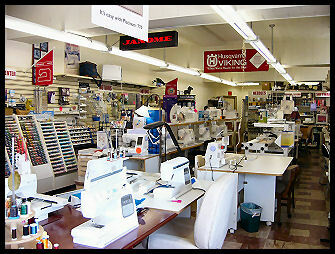 All the personnel at Don Kauffman's have years of experience with sewing and sewing machines. We are happy to answer your questions and help you choose the right machine for you. We're here to offer you help and support for every machine we sell. We provide classes at your convenience for any new sewing machine, embroidery machine, or serger you purchase from us. We are glad to provide telephone support and advice for handling problems with your machine or your sewing. We also offer classes in machine embroidery and embroidery software. If you have an embroidery machine you can come to us for help with embroidery problems, embroidery software or simply transferring your designs from the computer to your embroidery machine.